1. Go to the Account Settings page and select Pix4Dfields as a preferred solution. For more information: Cloud general questions. Ag RGB: For Sequoia RGB images solely. The output visible on the cloud is the orthomosaic. For more information: Processing Options Default Templates. Ag Multispectral: For discrete band imagery. The output visible on the cloud is the NDVI map. For more information: Processing Options Default Templates. Ag RGB + Ag Multispectral: When uploading RGB and discrete band images together. Processing RGB and multispectral images together is possible on Pix4D Cloud (unlike on Pix4D Desktop, where the images should be processed in separate projects). Such a project allows to visualize both orthomosaic and NDVI map on the same project on the cloud. 2.2. 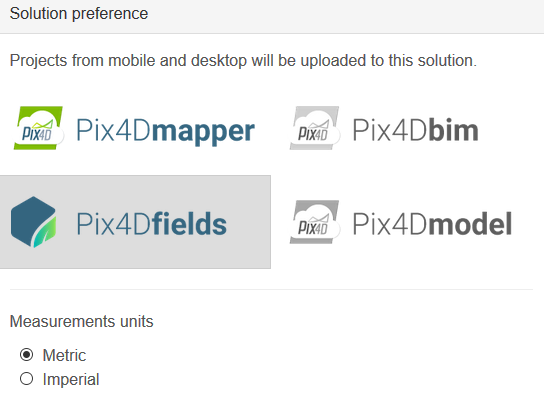 Upload the already created project from Pix4D Desktop to the cloud (Pix4Dmapper and Pix4Dag only). For more information: How to upload project files from desktop to cloud. 3. Visualize the outputs on the cloud. In order to visualize other outputs than the ones available on the cloud (e.g. reflectance maps for discrete band imagery), download the outputs. For more information: How to download results from the cloud. Information: For more information on how to use calibration target on the cloud: Radiometric calibration target. Note: In order to use specific processing options, create a new project on Pix4D Desktop, select the specific processing template and options and upload the created project from Pix4D Desktop to the cloud. For more information: How to download results from the cloud.